Here’s what’s happening in the world of television for Friday, December 7 and Saturday, December 8. All times are Eastern. Crazy Ex-Girlfriend (The CW, Friday, 9 p.m.): Meet Rebecca: She’s hard to summarize. And if you thought you knew her after four and a half seasons, the title of tonight’s mid-season finale suggests otherwise: Rebecca is not the person she was when we first met her. She’s accepted responsibility for her actions, pinpointed and combated many of her self-destructive habits, and begun to find genuine happiness by taking charge of her life. Tonight’s episode brings the return of a character who likewise is (quite literally) not the person he used to be. Fan favorite Greg Serrano returns to the Cov from his studies at the “Harvard of the South” (no, not Vanderbilt! ), and he’s looking a little… different. In fact, he looks an awful lot like Pitch Perfect’s Skylar Astin. When Greg, initially played by Santino Fontana, bowed out during the show’s sophomore year, the writers scrambled for a way to bring back his character. In an A.V. Club interview, Rachel Bloom explained that the change will be attributed to how we see someone in a different light after growing apart from them. 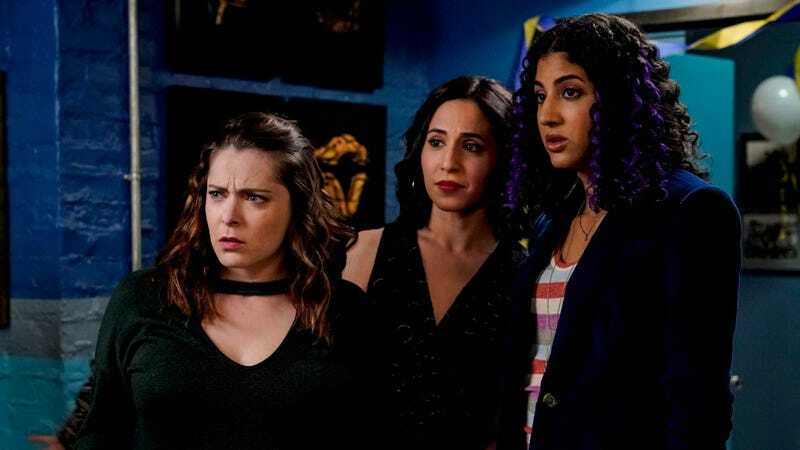 Given Crazy Ex-Girlfriend’s history of playing with unreality through musical numbers, flashbacks, and dream sequences, the show just might manage to pull this one off. And, given Rebecca’s sudden surge of confusing feelings regarding her other exes, Josh and Nathaniel (not to mention the fact that she slept with Greg’s father), the lovable curmudgeon’s arrival is sure to shake things up in West Covina. Allison Shoemaker will offer her take. RuPaul’s Drag Race Holi-slay Spectacular (VH1, Friday, 9 p.m.): Do you hear slay bells? That’s the sound of RuPaul’s Christmas special strutting down to VH1, where we’ll be graced with the return of some familiar faces (Shangela Laquifa Wadley, Eureka O’Hara, Mayhem Miller, Kim Chi, Jasmine Masters, Sonique, Latrice Royale, and Trixie Mattel), promising that the competition will be fiercer than ever! If you’re in need of some holiday cheer, watching the queens battle it out for the Drag Race Christmas Queen crown and lip-syncing to holiday music courtesy of RuPaul himself (with the aid of choreo by Todrick Hall) might do the trick. Allison Shoemaker will have the review.